When April Cohen, an interior designer and former restaurant owner, met Jim Ruzicka, he ran a machine shop in North Houston. It was a stressful job, so to relieve stress, I grew and propagated plants in my backyard. After a few years, I wound up with a whole lot of plants. Jim frequented April&apos;s Heart and Soul Café, often teasing her about trading plants for meals. One day, she decided to drop by and was astonished by what she saw – hundreds of plants filled his backyard. April suggested selling them, so they made 19 signs and posted them throughout the neighborhood. She asked me what I was going to do with all of those plants, and I said I didn&apos;t know! ​April suggested selling them, so they made 19 signs and posted them throughout the neighborhood. ​It was so much fun. We sold every plant in a single day. What began as a hobby soon grew into a thriving business. 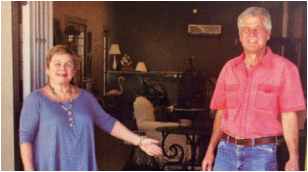 With her knowledge of decorating and design and his knowledge and love of plants, Jim and April made the perfect team.